*Always available for immediate shipment from Barnes & Noble. Jennette Green proves that she knows her stuff when it comes to sharing her knowledge and experience in her newest book, Book Formatting for Self-Publishers, a Comprehensive How-To Guide. This work is truly a comprehensive guide to formatting for both Print-On-Demand (POD) and ebooks, which covers the most popular venues for those sources. The author combines useful and specific information with clear and simple language to create a handbook for beginners and wanna-bes, as well as being a checklist for experienced writers and self-publishers. What a resource this is! The images of various computer screens as the book progresses makes learning the process even easier. Efficient, to the point, and easy to follow. 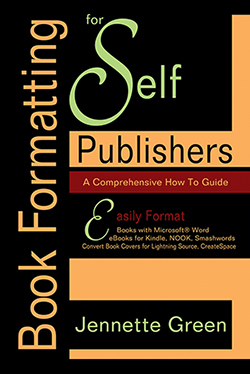 It’s a concise step-by-step guide that will help you format your own book and have it out on the market in a heartbeat. Book Formatting for Self-Publishers is perfect for busy people — from first time authors to small publishing houses — who don’t want to spend a lot of time figuring out an instruction manual first. The section on Book Cover preparation was especially helpful, since trying to format that perfect cover can cause many a migraine. Best of all, with Jennette Green’s book, you’re not only purchasing a very complete instruction book, but you’re also receiving the benefit of her years of experience . . . and years of troubleshooting. This reference book will have a permanent place on my company’s bookshelf. Excellent book! The topics are organized, detailed, clear and simply put; easy to read. The screen shots are very helpful. The difference in our first book is drastically different from our next one, thanks to reading Book Formatting for Self-Publishers. You can really see we followed a professional's example. Even though I was a novice, I was able to turn a basic word document into a professional looking book. Thank you for putting all your hard earned knowledge together for the rest of us. I really appreciate it! This is my reference manual from now on. Are you ready? Open up your Microsoft Word document, save it under a new name (to preserve your original copy), and let’s begin! Please note: Microsoft Word is best suited for novels or general nonfiction. If you will be publishing specialized nonfiction, with intricate page design, you may wish to consider using a professional page layout program, such as Adobe® InDesign®. The use of Adobe InDesign is not covered in this book. Copyright © 2010 - 2018 Diamond Press. All Rights Reserved.